People living with Rheumatoid Arthritis (RA) compare the pain and inflammation to a fire raging out of control. RA is a chronic, systemic autoimmune disease causing swelling, stiffness, and pain in the joints. It can result in joint deformity and damage to other organs, including the nerves, heart, and lungs. Approximately 1.5 million Americans have Rheumatoid Arthritis: most are adults over age 40; about 12,000 children under age 16 have juvenile-onset RA. The prevailing, conventional theory is that inflammation results from an “over-reaction” of the immune system that may include genetic factors. Doctors of natural medicine believe there is a deeper, root cause for this haywire immune system response. They theorize immune dysregulation originates in imbalances that involve a person’s genetics, lifestyle choices, nutritional status, gut health, stress, environmental triggers and emotional wellbeing. Conventional treatment includes physical therapy and prescription medicines (steroids, painkillers, and immune suppressors) to treat pain and swelling. While these drugs may be necessary for some people, they have side effects including hair loss, liver damage, stress on the kidneys and heart, and risk for addiction, without correcting the underlying imbalance. Natural medicine emphasizes identification and treatment of root causes. Holistic doctors use safe, natural therapies and interventions that stimulate the restoration of health without side effects. Here’s a sampling of holistic interventions that can make a huge impact in healing the root causes of RA. Commit to a diet that includes: organic fruits and veggies; healthy fats such as olive, avocado, and coconut oils; whole grains; bone broth; wild-caught fish; and nuts/seeds. These foods provide natural antioxidants – cellular superheroes that gobble up the free radical cells that contribute to development of RA. There are many foods that are considered healthy in general, but may cause inflammation for some people, leading to immune dysregulation. Holistic doctors will test for food sensitivities, such as gluten, dairy, egg, or others, and work with a patient to create a diet with healthy alternatives when needed. Movement is important for managing symptoms (including pain) and enhancing psychological wellbeing. Low impact exercise, such as cycling, walking, water aerobics and Tai Chi, are ideal. Symptoms can improve with strength training. Massage therapy, acupuncture or acupressure, reflexology, yoga, deep breathing, and guided imagery provide protection against painful bouts of RA by helping improve body awareness, reduce muscle tension, enhance sleep, and decrease stress hormones. Nutritional and herbal supplements can help reduce pain and inflammation. Vitamin D deficiency is associated with RA, so supplementing can be important. Extracts of ginger and turmeric, Omega-3 fish oil and digestive enzymes are some nutrients that help tame the fire of inflammation. A natural medicine approach to healing RA will be unique to each person. Consult with your holistic physician for interventions that will work best for you. The Red Bell of the Ball! Crisp, sweet red bell peppers are versatile and packed with nutrients. They’re loaded with the antioxidants Vitamin C and A, which support immunity and help the body fight free radicals – molecules implicated in inflammation and many disease processes. That beautiful red color is attributed to the nutrient lycopene, another antioxidant. Vitamin B6 and folate – nutrients that support red blood cells – are also found in these crimson beauties. Making red bells a regular part of your diet can help protect against chronic illnesses such as heart disease, joint disease, and cancer. Red bells are actually the fully ripe version of green bell peppers. With the exception of very cold winters, they’re available year-round in most places. Choose peppers with deep color, taut skin, and fresh-looking stems. Peppers should be firm and heavy for their size (indicating they are well hydrated). They add flavor to sandwiches, stir-fry, salads, soups, stews, sauces, and are also delicious raw. You may have heard that peppers are a part of the nightshade family of vegetables and aren’t a good food choice for some people. Nightshades (including potatoes, eggplant and tomatoes), are so named because they grow best in shady areas and some bloom at night. For most people, nightshades are a healthy choice, but for others, they can trigger a reaction similar to that seen with soy or dairy. If you’re concerned about this, consult a natural medicine practitioner for dietary testing and guidance. Delight friends and family with this perfect summer picnic supper or lunch entree. 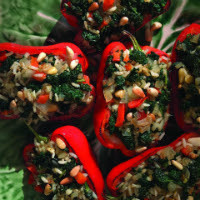 The crimson flesh of red pepper gives bright contrast to kale’s deep green. Chopped onion and minced garlic combine with lemon and herbs to bring an aromatic flavor to the brown rice. Delicious, filling, and vegan friendly, too! To prepare peppers: Preheat oven to 400°F. Halve peppers lengthwise through the stems, leaving them attached. Remove the seeds. Lightly brush the peppers outside and inside with oil; sprinkle insides with salt and pepper. Place, cut-side down, in a 9-by-13-inch baking dish. Bake until just tender, 10 to 15 minutes. Let cool slightly. Turn cut-side up. To prepare filling: Bring 2 cups salted water to a boil in a large wide pan. Stir in kale, cover and cook until tender, 10 to 12 minutes. Drain, rinse under cold water; squeeze dry. Finely chop. Heat oil in a large nonstick skillet over medium heat. Add onion and chopped bell pepper; cook, stirring often, until onion is golden, 6 to 8 minutes. Add garlic and cook, stirring, for 30 seconds. Stir in the kale. Remove from the heat and let cool slightly. Stir in rice, Parmesan, 2 tablespoons pine nuts and lemon juice. Season with salt and pepper. Divide the filling among the pepper halves. Sprinkle with the remaining 2 tablespoons pine nuts. Add 2 tablespoons water to the baking dish. Cover the peppers with foil and bake until heated through, 15 to 20 minutes. Uncover and bake for 5 minutes more. Serve hot. Time Saving Prep Tip: Follow Steps 1, 2 & 3. Cover and refrigerate up to 2 days. Brown Rice Prep Tip: Place 1 cup brown rice, 2 1/2 cups water and a pinch of salt, if desired, in a medium saucepan; bring to a simmer. Cover; cook over low heat until rice is tender and most of the liquid has been absorbed, 45 to 50 minutes. Makes 3 cups. Turmeric (Curcuma longa) is the golden-orange spice that gives curried foods pizzazz. In Traditional Chinese and Indian Medicine, turmeric is used to treat allergies, digestive ailments, and pain. The active chemical component of turmeric is curcumin, known for its anti-inflammatory properties. Today, research is focused on the role curcumin plays in diseases where the underlying factor is inflammation, such as in heart disease and arthritis. Studies show that curcumin blocks inflammation at the cellular level. Some studies indicate that curcumin’s role in preventing joint inflammation surpasses its ability to reduce active joint inflammation. In clinical trials, standardized curcumin supplements helped improve pain and swelling in patients with RA. These promising results are being further investigated in long-term studies. Including turmeric in your diet is easy to do and, oh, so flavorful. Add turmeric to soups and dressings; sprinkle over meats, veggies, and scrambled eggs; add it to plain yogurt or a smoothie. While adding turmeric spice to your meals is a great first step, the amounts used in cooking do not provide the therapeutic levels needed to achieve its robust health effects. When considering the addition of turmeric to your health plan, work with your holistic health practitioner to determine if this is a good choice and which curcumin supplement is best for you. He or she can recommend the right form (capsule or powder) that will have the best bioavailability – meaning it’s easy for your body to process through the digestive tract – for your specific health needs. Native to the Amazon rainforest, Cat’s Claw (Uncaria tomentosa) gets its name from the inch-long hooked thorns that allow this tropical climbing plant to anchor itself to trees and wind its way up 100 feet or more into the forest canopy. As they have for centuries, indigenous people and herbalists use the roots, leaves, and bark in preparations for asthmas, arthritis, rheumatism, urinary and kidney problems, and inflammation. In modern herbal medicine, Cat’s Claw is recommended for chronic illnesses such as fibromyalgia, chronic fatigue, mononucleosis, and arthritis. A potent antioxidant and anti-inflammatory botanical, Cat’s Claw is used to treat joint problems that occur with osteoarthritis and rheumatoid arthritis. In a small clinical trial, Cat’s Claw was shown to decrease pain in patients with rheumatoid arthritis, as well as osteoarthritis of the knee. The medicinal benefits of Cat’s Claw come from chemicals called pentacyclic oxindole alkaloids, which boost the immune system and help temper inflammation. The concentration of medicinally active chemicals in Cat’s Claw vary based on when and how the plant is harvested. A holistic health physician will be knowledgeable about a product’s purity and potency, as well as which form of Cat’s Claw supplement is best for you. For example, your physician may suggest tea, tincture, extract or capsule depending upon your health concerns. Some people experience upset stomach, headache or dizziness when using Cat’s Claw. Also, it is not recommended for women who are pregnant or nursing, or for children under age three. Cold Laser (CL) is a non-invasive therapy that helps reduce joint or muscle pain and swelling, while improving the rate of repair in the affected area. It’s used to treat injuries (e.g., sprains, tendinitis, muscle spasms) and joints affected by illness, including arthritis, fibromyalgia, neck and back pain, and nerve pain syndromes. How does Cold Laser Work? A low-level red or near-infrared light is emitted and absorbed by soft tissue, which leads to a change on the cellular level, giving damaged tissue a “boost” to promote regeneration. It helps the body rebuild connective tissue and release pain-relieving substances called endorphins. Applied by a doctor, therapist, or technician once or twice weekly, treatments take about 10 minutes. You’ll feel the device moving against your skin, but there is no sound or vibration. Does CL Therapy Work for RA? The experience of pain is highly variable among different people, including those living with RA. Studies using CL show promising results for reducing morning pain, stiffness, and swelling over 4-12 weeks, but more long-term research is needed. Many types of Cold Laser (CL) devices are approved by the FDA and are sold online for use at home for the temporary relief of pain. This only means that the device is safe to use – it may not be effective for all conditions or symptoms. Consult with a health practitioner (ND, DC, PT or OT) who understands this treatment and can guide you in receiving this therapy or, if appropriate, educating you on purchasing the best device for use at home.